Add a parish, diocese, or bishop badge to your website or blog! A badge displays real-time statistics about who's praying on Rosary for the Bishop. Everyone is invited to join Rosary for the Bishop, a program organizing Catholics to pray the rosary for their bishops. The official website, www.rosaryforthebishop.org, lets you choose which days you wish to pray, then sends an optional reminder email so you don't forget. Plus, you can view statistics about how many other people are praying, including a world map of participating dioceses at www.rosaryforthebishop.org/maps. Catholics all over the world are praying for their shepherds through Rosary for the Bishop: visit www.rosaryforthebishop.org/join to sign up today! Your parish can help spread the word about Rosary for the Bishop by printing a bulletin announcement. A sample announcement is available to the right, or you can write your own. You can also include the latest stats in your announcement if you'd like. We now have Rosary for the Bishop flyers! 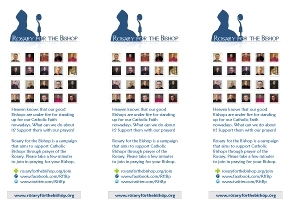 They print three-per-page, double sided, with some basic info about how Rosary for the Bishop works. Share them with your friends and family, or ask your church if you can place some flyers at the back. Printing note: make sure to set your print mode to 'landscape' and set scaling to 'none' to make sure the flyers are aligned properly. Catholics from Madison, Wisconsin have started a website encouraging the faithful to pray the rosary for their bishops. At rosaryforthebishop.org, you can choose which days you would like to pray for your bishop. The site can send an optional reminder email so you don't forget, and statistics are available about how many other people are praying, including a world map of participating dioceses. It's time to start praying for our shepherds, and Rosary for the Bishop a great way to do just that. For more information on how to join, visit rosaryforthebishop.org. A short sample story is available to the right. You may also want to check out the news section of this site for press releases and more. For interviews or other information, please contact us.